"Created by the U.S. Department of Defense's Advanced Research Projects Agency, the original ARPANET was a network of just four computer terminals installed at universities and research institutions in California and Utah. With its truncated missive 40 years ago, today ARPANET became the world's first operational packet-switching network.
" 'Packet-switching was the original transmission mechanism [for our network] in 1969 and is still the underlying technology of the Internet today,' said Leonard Kleinrock, a UCLA computer engineer who was involved in ARPANET's creation. In a packet- switched connection, a message from one computer is broken down into chunks, or packets, of data and sent through multiple routes to another computer. Once all the packets arrive at their destination, they are pasted back together into the original message. 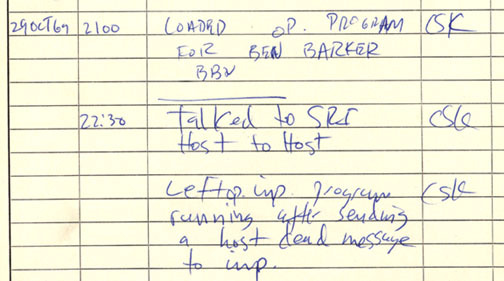 This is the log of the first message sent on the Internet. "By contrast, data packets in a packet-switched transmission have multiple routes open to them and will hop on to the one with the least amount of traffic. In this way, no route is idle for long. In the years following, ARPANET's deployment, other packet- switching networks were created, but they were internal networks that had only limited access to one other. It wasn't until the mid-1970s that engineers developed a way to merge networks to create the Internet. In 1984 the domain system that includes .com, .gov, and .edu was established. A decade after that, the first commercial web browser, Netscape, became available."